If you're trying to build a wardrobe that takes you from SAHM duties to a business casual workplace like I am, you need some basics. When I bought these two tanks I knew they would be pieces I'd be able to get a lot of wear from. They are really basic, a little gathering on the back but otherwise just plain and colourful tanks. Simple tops like this are good to wear to the office as well as the other days I'm a SAHM with the boys. An simple, staple office outfit. Closed in shoes, a bag big enough to carry everything needed for a day at work, blazer and a simple basic tank. 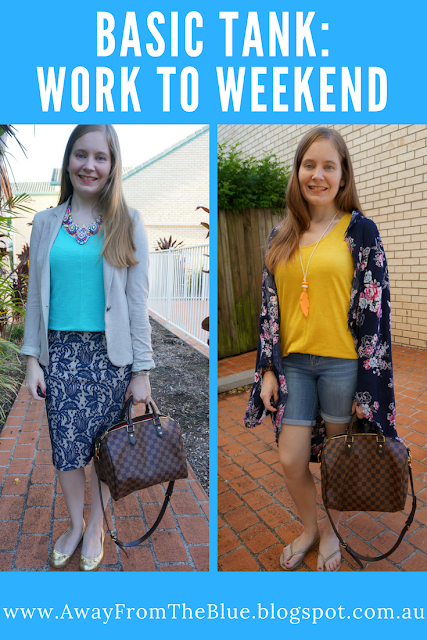 Even if the heatwave in Brisbane meant that the blazer was quickly taken off after these pictures and only worn in the office air conditioning! It has been such a hot end to summer. 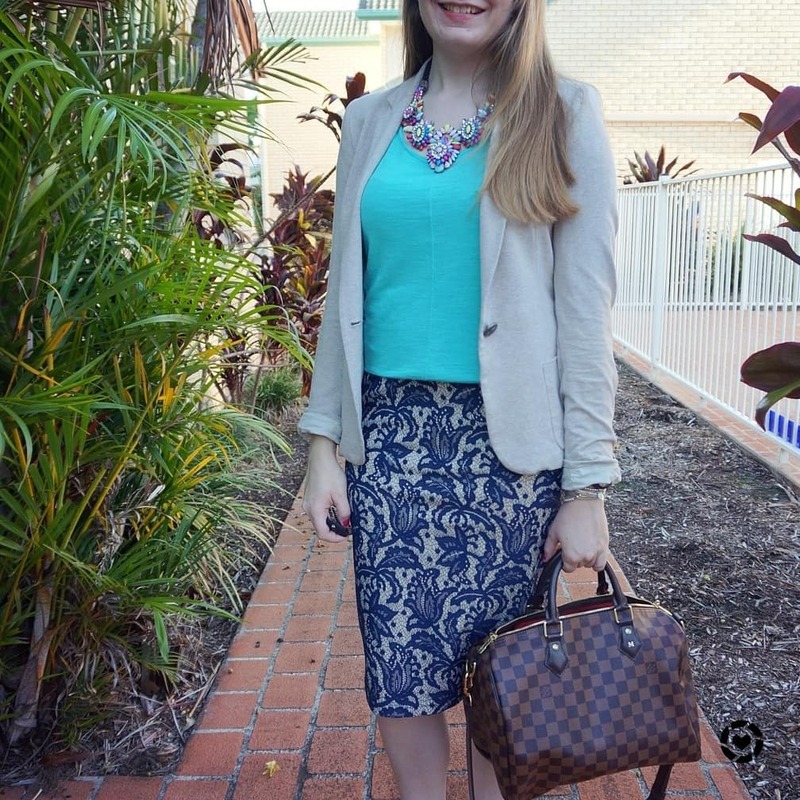 While I love my printed dresses for work, a variation of this outfit is often worn as I love my pencil skirts. 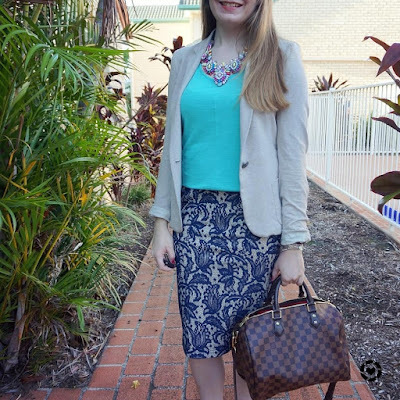 A pencil skirt and blazer can have a casual tank underneath if you're in a business casual workplace like I am, or a dressier blouse or button up shirt for more formal environments. With a basic top and classic plain blazer, you can add more interest to your office outfit with a fun statement necklace or printed pencil skirt. I love the textured lace on this one. 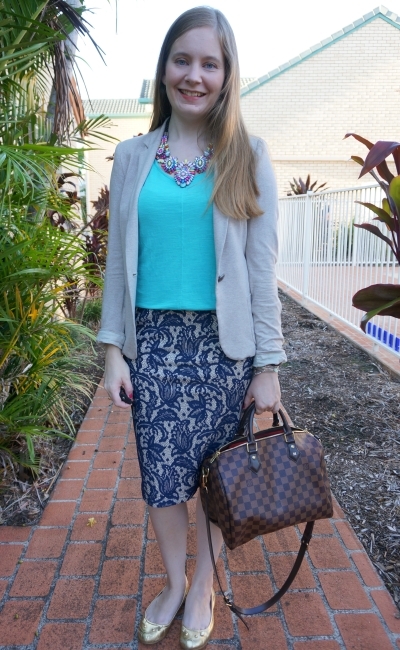 Last worn: jersey blazer, blue tank, lace pencil skirt, gold mouse flats, Louis Vuitton speedy bandouliere. Other ways to wear: jersey blazer and printed dress, blue tank and printed shorts, lace pencil skirt in winter, gold mouse flats and wrap dress, Louis Vuitton speedy bandouliere for travel. Perfect for pregnancy: cream blazer in second trimester, lace pencil skirt in third trimester, gold mouse flats in second trimester, Louis Vuitton speedy bandouliere in second trimester. Another super-hot day, at the height of the heatwave. We were spending the morning in aircon so I added the kimono to keep me cosy, and also because I'd been wanting to try the navy floral with the mustard tank. I really like this outfit and felt great in this. I'll probably try this kimono and tank together again soon, I loved the colour combo. I ended up taking the kimono off in the afternoon though as we ran around on a couple of errands. Even the brief moments between the air conditioned car and building made it too warm for any kind of layer! 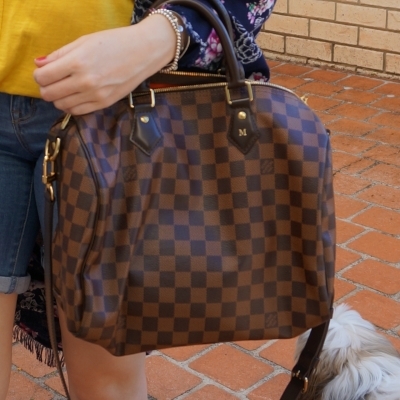 Carried my Louis Vuitton speedy bandouliere bag again, I needed something fairly indestructible, and this is perfect as it's waterproof and easy to clean. Since I was spending the day with the boys, I swaped the pretty but not kid friendly statement necklace I wore to the office with this much more kid friendly silicone teething necklace. Easily washable too, just like the Louis Vuitton handbag. Last worn: floral cocoon kimono, mustard tank, bermuda denim shorts, Havaianas, Louis Vuitton speedy Bandouliere (above). Other ways to wear: floral cocoon kimono and flared jeans, mustard tank and printed shorts, bermuda denim shorts and button up shirt, Louis Vuitton speedy Bandouliere and colourful jeans. Perfect for pregnancy: floral kimono in third trimester, speedy bandouliere in second trimester. Basics are the best building blocks to have in your wardrobe, especially if you want pieces you can get more wear from. These tanks, while different colours, are the same simple cut and are so easy to dress up or down. With a few tweaks like swapping the fun kimono for a more formal blazer, and the casual denim shorts for a pencil skirt, it's easy to make a casual outfit perfect for the office. If you're on a budget, investing in a few pieces like this makes it easier to get more value from your purchases as you can wear them for different events. You don't have to spend big, both of these tanks were under $20! Linking up with Turning Heads, Trend Spin, Confident Twosday, Wardrobe Wednesday, Style on the Daily. Omg, you look so beautiful my dear. I love your both outfits and so impressed with the way you styled it. However my favorite style is the second one. It so bright and cute. Have a great day 💞💕. I've decided I need a new tank or two so I'll have to investigate Jeanswest. Those look really nice and have just the right amount of flowy-ness. Office air conditioning is kind of annoying - obviously I don't want to be sweaty, but it seems to always be cranked up too much so I'm absolutely freezing. Taking almost a whole new outfit to put on once I get to the office seems a bit ridiculous but is apparently necessary! Yep if I'm not wearing a blazer, I have a cardigan I need to take to wear in the office! And yes, the struggle of finding a tank that perfectly flows is real! I'm starting to buy multiples now when I come across it. What versatile looks! i like having a simple top, blazer and pencil skirt in the office too (or a nice dress). It's nice to see the kimono again - it's lovely! Both of these outfits are so stylish. Your work outfit very professional and chic. That skirt is so pretty. It looks great paired with that blue tank top. You are right, tank tops are a great item to have in our closets. I also really like your casual outfit. This yellow tank looks fabulous worn with shorts and a kimono. The kid friendly necklace is adorable. The bag is super pretty and it looks fabulous styled with both outfits. I recently got this exact bag in a size 25 and I am in love. Great outfit as always. Hope you're enjoy your week! Tanks really are perfect for both work and play! All you need is something different on top to make it professional or casual! Tanks are so multipurposeful, that I always think they are a great idea to add a new one here or there! !And the yellow or blue adds such fun color to any outfit!! I love basic tanks! They are always so cute. I love the workwear outfit! I find it so hard to find outfits that look super cute but are flowy and cool enough for work. That skirt is perfect on you. In my experience, basic tanks are always a good investment! You can dress them up or down as you need and practically wear them all year round with layering. 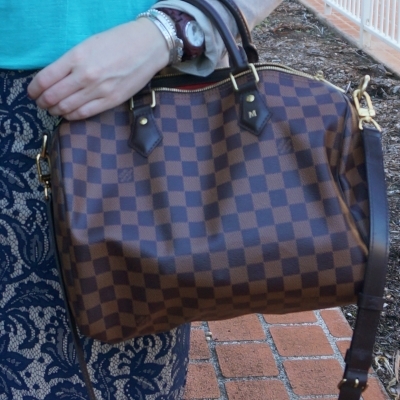 I also love the Louis Vuitton! Thanks! Yes these were a great purchase, even though not quite an investment as they were so affordable haha! Love the tank and how you styled it! You look lovely, babe! Most of my basics are black or white, I should consider incorporating more colors into my wardrobe. You outfits look so muh more interesting that way. I love having a few plain colored tank tops and tees for warm summer days! These are perfect and I love the bright colors! The yellow tank looks especially good with your navy kimono. What a great combination! Hope your week has started off well! I am so with you--basics like tanks and tees are essential for building a wardrobe that works for both work and home days. I love how the right accessories can totally change-up a look. Both of these looks are great, but I can never get enough of your kimono looks. Love that one! Colorful tanks are a great staple for the summer and you've certainly demonstrated their versatility with these outfits! 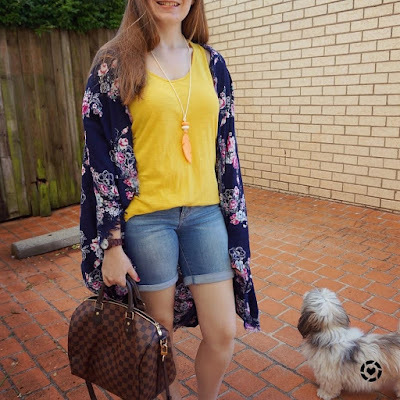 Loving your kimono in the second look! That's a great classic bag Mica. Love the different colored camis! They are a great addition to your wardrobe. Can be worn with so many things. They really change an outfit up. Those tanks are super versatile! They go perfectly with each outfit and add such a nice pop of color! And I've probably said it before, but I love that kimono!! These tanks are perfect for layering. I like to wear these for work most days. All the bright colors are so pretty too! I never put my tank tops away. They stay in my closet year round for layers in the fall, winter and spring and to wear in the summer! I love how a basic tank or tee can be dressed up for work and back down for the weekend. Love these colorful tanks and that kimono! I wear tanks with almost everything as I'm always getting warm and love the option of removing layers. I am longing for when I can wear tanks again and live in them! It's just so cold lol! Happy Tuesday Mica! The Speedy! Such a classic, and you rock it so well. Hope you're having a happy week so far, babe! Wonderful outfit. The bag is gorgeous! You styled this tank top beautifully. I love it in the bright yellow and also the turquoise color. I love how you styled it from office to casual. And you know I adore your kimono! I hope the heat gets a little bit more tolerable there! Thanks! It's autumn now, so hopefully it will cool down soon! When one piece gives you a thousand outfit ideas, it's a winner. Tanks are winners! Love what you wore to work. Awesome! Love how you styled your tanks for two different occassions! The work outfit is one of my favroite work looks from you, yep! That's how much I loved that skirt and the well, the whole outfit to be honest! Also, you pull off so well a yellow top, which is not always easy. The kimono is such a great piece to add layers on summer! Basic tanks are so useul and versatile! And I love you LV bag! Both looks are so great! I love the accessories on both. That necklace is so pretty! I am never comfortable enough (no matter how hot) to take of my topper when i am wearing a tank top- I feel too exposed! The heat here means it's necessary to remove extra layers often, haha! Thank you all for your lovely comments - glad you enjoyed my post!